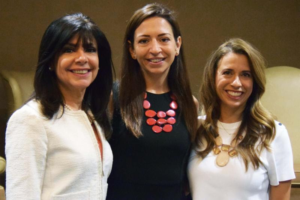 The 2016 Athenas Dr. Maria Harper-Marinick, Maricopa Community Colleges, Catherine Alonzo, Javelina, and Rebecca Clyde, Ideas Collide participated in a panel discussion at the Professional Women’s Alliance luncheon last week. There was all kinds of awesomeness happening in that room, and I took pages of notes as these talented and smart ladies answered questions about their own journeys, businesses, and lives. It was inspiring. It was empowering. It was authentic. I found the thoughts shared by these Athenas to be leadership advice that resonated with me in a way I’d never experienced before. I began my own career in a male-dominated technology field. My experience has been that traditional leadership classes have been from a decidedly male perspective. As I walked out of the room, I couldn’t help but think that these words, this advice, this feminine perspective on leadership is important. We can’t just walk out and leave it there. It needs to be captured and shared so the inspiration and empowerment can continue, even as the luncheon ends. Lesson 1: Practice Ruthless Prioritization. Catherine shared her practice of ruthless prioritization. As a leader, we are trying to balance work, family, personal lives, fitness. We seek to reduce the stress in our lives and find time for living in abundance in all these areas. Catherine shared that she practices “ruthless prioritization.” By looking at each request before it makes it to your calendar and asking, “What is the return on investment (of my time)? What will you get out of this activity? Consider that for everything for which say yes, you are saying no to something else. Will what you get out of this yes be worthy of your time? Be consistent. Be persistent. Be unforgiving. Lesson 2: Banish negative talk. Who of us, hasn’t uttered similar words? This realization was enough to prompt her to pay attention to her own negative talk. She chose instead to banish the negative talk and talk to herself as if she is her own friend. Wow! What a concept. We would never let our friends get away with saying negative things about themselves. Let’s be our own friends! Let’s talk to ourselves like we would talk to a good friend. Lesson 3: Get a coach that won’t let you get away with less than your own potential. All three of the Athenas spoke about the importance of mentors. Maria shared about a teacher who wasn’t the best teacher but was a great mentor. Why? Because a great mentor believes in you before you believe in yourself. While he was tough on her, she realized it was because he never let her get away with lower standards for herself than he had for her. A great mentor/coach will see the best in you and help you realize your full potential. In all my years in business leadership, I have never before heard anyone talk about intentional kindness. Catherine so simply stated, “All we really have to give each other is kindness. Maybe it’s a smile, maybe it’s a compliment.” As we become who we are meant to be, as we grow our businesses, as we rise to the top, we do it with intentional kindness. Yes! Lesson 5: Help others be their best. Rebecca stated, “If I’m going to do big things, I’m going to need others.” Gathering the right team and knowing when/what to delegate are important. Equally important was seeing the potential in others and helping them to realize the best version of themselves. By surrounding ourselves with passionate people who share our values and helping them achieve, our businesses and our communities thrive. Lesson 6: Be consistent in your values. Maria asked us to consider, “How do we use our values to facilitate our message?” Catherine talked about understanding our why… why are we doing the things we do? Each of the Athena women was strong in their values and they let themselves and their business decisions be guided by these values. There is a model of efficiency and a model of gratitude. Being efficient is prized in business, as we are always striving to reduce costs, shorten cycles, improve service, etc. Equally as important for these Athenas was a model of gratitude. As Maria said, “I’ve been so blessed, I need to give back. Be 100% present. Make a difference.“ Practicing gratitude has helped to launch each of these women to the top of their fields, and to make a difference for others and their communities at the same time. Lesson 8: Don’t let the naysayers break you down. There will always be those who want to break you down. Just keep going. Rebecca shared a story of a woman who just did this naturally. This woman wasn’t the one with the biggest title, she was the one with the biggest vision. She had big ideas and she believed in them. While others were deep into why something couldn’t be done, she just got things done. She tuned out the naysayers and kept moving forward until it was done. And then she tackled her next big idea. Lesson 9: Get outside of what you do. Lesson 10: It will be really hard. And then it won’t. Learn More! Continue the conversation with a free 30 minute coaching session with Phoenix Motivational speaker Jean Briese Free 30 Min Coaching Session and Subscribe Now for more tips on living abundantly.